So how can retailers use this trichotomy to guide them towards the best performing customer experience programs? Each retailer group has distinct traits that place them in their category. Price-based retailers offer their products at the lowest possible prices, which is highlighted in communication to consumers. Balanced retailers offer products that are considered as widely available and diverse in both price and selection. Premier retailers offer highly specific products or services that are considered premium with an elevated price-point. Since the three retailer categories are so diverse, each must approach customer experience in a different way. What will define the winners? Premier retailers will cultivate memorable experiences. The customer base of premier retailers is primarily high-income earners, specifically the top 20% who earn more than $100k. These shoppers have the largest amount of money available for discretionary spending and appear to be willing to spend it, as premium retailer revenue skyrocketed 81% over the past five years. But when this exuberant market returns to historic levels, who will continue to thrive? Those who have invested earnings into quality experiences that go hand in hand with their quality products. According to studies by psychologist Daniel Kahneman and his team, people tend to judge an entire experience based on how they felt at its peak (a highly emotional moment) and at the end, rather than the whole experience. In other words, humans are not accurate experience recounters. This bias is called the peak-end rule and implies customers may classify an entire experience as negative when the final interaction is unsatisfactory, even if the experience was positive or neutral overall. Therefore, premier retailers must invest heavily in customer experience journey mapping to identify key peak and last interactions across customer journey points. Once pinpointed, the focus can shift to making those moments memorable. 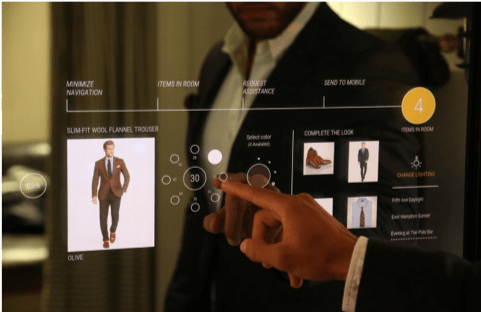 An emphasis on memorable moments allows for experience innovations like the smart-mirror fitting rooms installed at Ralph Lauren. They are creating a positive peak experience in their fitting rooms, drawing traffic to the location where shoppers become customers. By highlighting key positive moments, premier retailers will continue to benefit from paying close attention to their customer experience. Price sensitivity and experience sensitivity are not mutually exclusive. Price-based retailer revenue has also risen in the past five years, growing 37%. This retail category’s customer landscape encompasses the lower 40% of consumers who make under $50k and are subsequently particularly sensitive to price points. Customer expectation, price and otherwise, factors into how these customers perceive experiences at price-based retailers. Centriam’s 2017 Retail Survey found that customers are far less likely to recommend retailers when their experience does not meet their expectations. 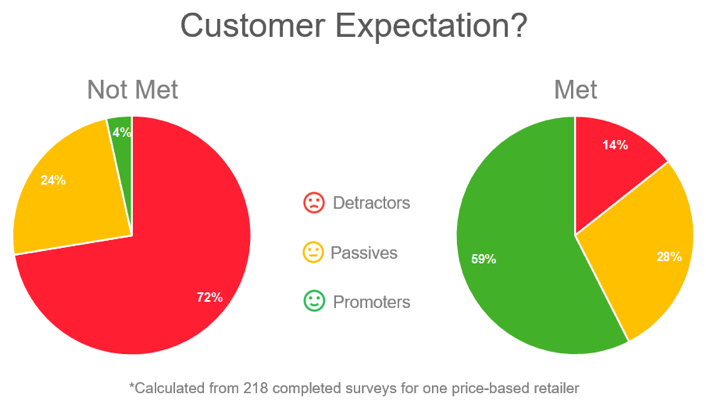 These results were maintained when filtering results for price-based retailers: only 4% of people whose expectations were not met were promoters versus 59% for those whose expectations were met. In addition, customers who frequent price-based retailers seem to lower their customer experience expectations in return for lower prices. When asked for opinions on what a price-based retailer could improve on, one customer described themselves as “cheap” and thus would continue to shop at the price-based retailer regardless of the experience. However, this doesn’t mean that price-based retailers shouldn’t invest in customer experience, it just implies that they should be more careful about their business use cases. The same customer cited ways to improve on some general shopping experience elements, including lighting (“dim and ugly florescent lights that alter the colors of everything”) and layout crowding (“no room to get a cart in the clothing areas”). As stated, this person will continue to shop here, but enhancing the experience will earn a larger portion of their total spend and lead to more recommendations. One way price sensitive retailers can improve is to involve the customer in their own experience, which can sometimes surprise with non-intuitive improvements. Retail chain ALDI requires their customers to pay a quarter to use a shopping cart in store which is given back once the cart is returned to the store. The customer is now in charge of cart retrieval, a customer experience taken for granted (and free) elsewhere. Yet ALDI markets it as a positive experience by telling the customers that their quarter is actually saving them money! ALDI can keep prices low because they are minimizing resources spent collecting carts scattered across the parking lot. In this version of customer experience management, ALDI is reinforcing that saving money is the “mission” behind a customer’s shopping trip. If returning a cart means a customer can continue to save more money in future excursions at ALDI, why wouldn’t that be considered a net positive experience? Price-based retailers can be more specific when investing in customer experience as compared to the premier retailers because their customers will keep coming back for the low prices, but it’s the continued reinforcement of positive experiences that will nourish an expanding customer base. This will be especially important if wage growth returns to the bottom 80% of households. These customers will have more money to spend, and more places where they can afford to spend it, but positive experiences will build relationships to keep them coming back to the price-based retailers. Balanced retailers need customer insights to tip the scales. Unfortunately for the balanced offering retailers, they have not seen the increase in revenue experienced by the other two groups. In fact, the balanced retailers have seen a 2% revenue decrease in the last year, putting intense strain on cash flow and causing brick-and-mortar store closures across the country. Bankruptcies are becoming more common too, with Toys R Us, Payless and RadioShack declaring in 2017, followed by Nine West and Bon-Ton in the past two months. For this group, customer experience can be the difference between a retail survivor and a retail fatality. Retailers who identify as balanced must make sure that they are being mindful of their customer base when designing their customer experience journeys or marketing strategy. They need to be customer obsessed, understanding why their customers are coming to them versus premier or price-based alternatives. Once they know what draws in their customers, they should invest heavily in customer experience strategies to continue promoting that behavior and subsequently consumer growth. A revenue component is a must for any customer experience business use case, and smart prioritization is essential for this group of retailers. Target seems to have capitalized on this approach to customer experience through their limited-edition brand releases, most recently their collaboration with Hunter. Combining desired brand names with affordable prices keeps current customers coming back for more and introduces variety to draw new consumer revenue. By looking at a more granular and specific view of their customers through a revenue lens, balanced retailers can design a customer experience strategy tailored to their brand. All three retailer categories require a careful and customized approach to customer experience management. It is the tailored prioritization of brand specific business cases that will make or break a retailer in this marketspace. Check out our other blogs for examples of customer experience innovation and how customer experience investments may reduce marketing costs to continue building your customer experience business case. And remember to follow this blog for further discussion on customer experience management!